You are currently browsing the tag archive for the ‘Hawley Pratt’ tag. ‘The Last Hungry Cat’ must be one of the best entries in the Tweety and Sylvester series. 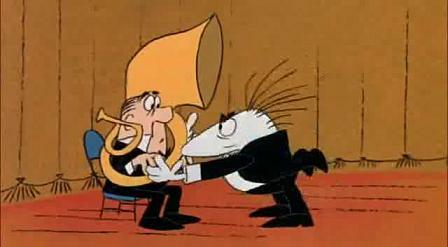 The short is a parody of the television show ‘Alfred Hitchcock Presents’, which aired from 1955 to 1965. Luckily, you don’t have to be familiar with this program (I’m not) to enjoy this cartoon. Introduced by an Alfred Hitchcock-like shadow of a pig, the short tells the story of Sylvester, who for once thinks he has actually eaten Tweety and who is then eaten by guilt. 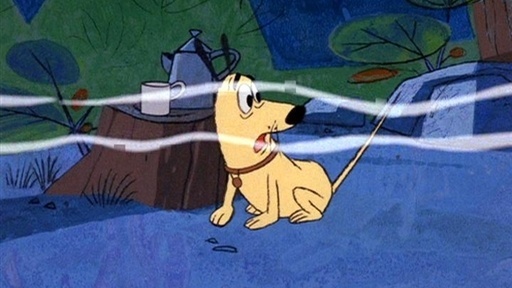 The cartoon makes use of a conscience-like voice-over and very beautifully colored and a surprisingly large amount of well-staged angular backgrounds (staged by Hawley Pratt, who gets co-directing credits, and painted in beautiful blues and yellows by Tom O’Loughlin). The images succeed in evoking an atmosphere that reflects Sylvester’s inner feelings. Especially the staging of Sylvester’s sleeplessness is very well done: still images of Sylvester lying awake are inter-cut with close-ups of his alarm clock, in rapid succession, zooming in all the time. These scenes are accompanied by Milt Franklyn’s ominous music and insistent ticking of the clock, only. 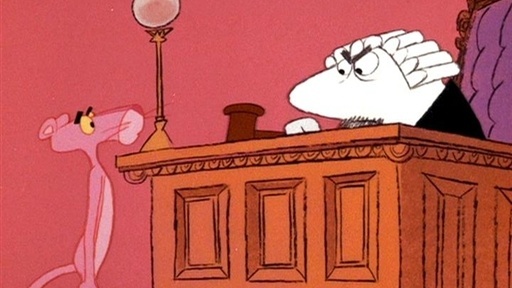 It’s a surprise such a well-made, beautiful and compelling cartoon could be made as late a 1961. The short is a worthy addition to the very small guilt cartoon canon, which also includes ‘Nursery Scandal‘ from 1933, ‘Pudgy Picks a Fight‘ from and ‘Donalds’ Crime’ from 1945. 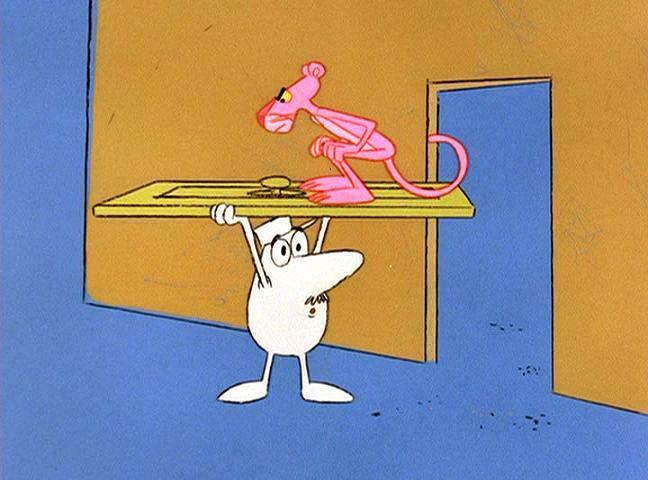 In ‘Pink, Plunk, Plink’ the Pink Panther spoils a performance of Beethoven’s fifth symphony by trying to play his own theme music, much to dismay of the conductor (the little guy). 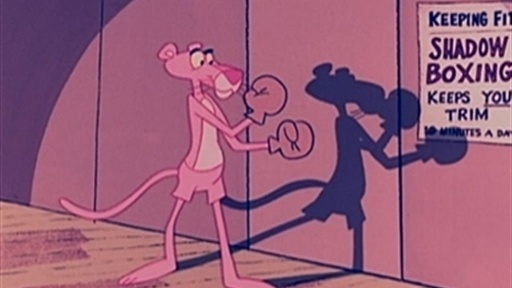 The Pink Panther finally succeeds to replace the conductor, but there appears only to be one man in the audience, Henry Mancini, composer of the Pink Panther’s theme music, himself (live action footage). ‘Pink, Plunk, Plink’ is not one of the best concert cartoons ever made, but the little guy’s frustrations are wonderfully animated. The little guy from ‘The Pink Phink‘ (1964) and ‘We Give Pink Stamps’ (1965) returns and this time to stay. Luckily so, for the little guy unwillingly helped to make better Pink Panther cartoons, being the perfect foil for the panther’s antics. In ‘The Pink Blue Print’ the little guy is a construction worker trying to build a house. 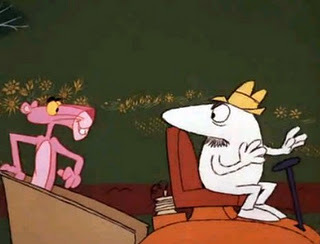 He’s hindered by the Pink Panther the same way he was in ‘The Pink Phink‘, leading to nice blackout gags. 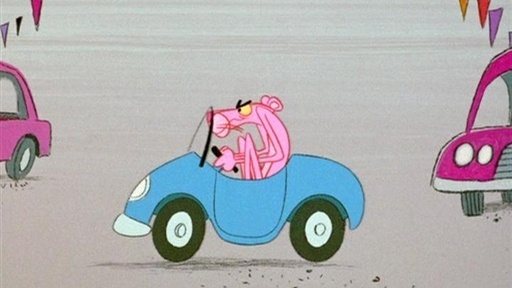 In ‘Pink Pistons’ the Pink Panther buys a new car with anthropomorphic features, but after a race against an old lady he turns it back in again. 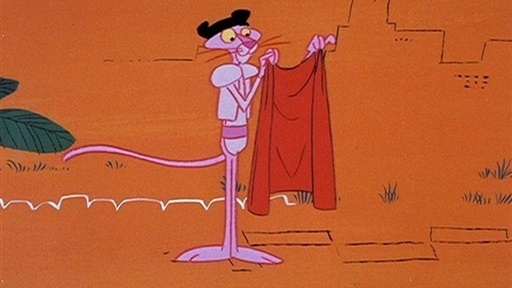 This cartoon has a great opening scene of the Pink Panther trying some new models. Unfortunately, the rest of the cartoon does not maintain that level. In ‘Bully for Pink’, the Pink Panther wants to be a bull fighter and so he steals a magical cape to use it as a red sheet. ‘Bully for Pink’ is slightly funnier than contemporary Pink Panther cartoons, but it doesn’t come near the heights of bullfight cartoons like Tex Avery’s ‘Señor Droopy’ (1949) or Chuck Jones’s ‘Bully for Bugs’ (1953).